A few weeks ago I bought a couple of books. After they were unwrapped and side by side, I could see the sick humor of my subconscious. One was the latest from the Joe Beef men, Surviving the Apocalypse: Another Cookbook of Sorts. The other was Almost Everything: Notes on Hope, Anne Lamott’s new book. It is especially tough to be a human today. We often need to hold opposing thoughts in tandem. How free should hate speech be? Do I eat more or less fish from the ocean? Should I contribute to retirement or start digging a survival bunker in the basement? As an Edward Gorey romantic, the thought of keeping bottled cordials and pork confit for the end times helps soften the peril. Having a decent spread of snacks on the edge of darkness certainly could not hurt. Along with the cockroaches and amoebas, if there was only one surviving appetizer after the bloodbath, I would hope for chips and dip for all remaining humanity. There is a place in my heart for Heluva Good!, but its inclusion of monosodium glutamate saddens me. It is not that I am evangelically opposed to the stuff, it just feels like cheating. Plus if the world were starting from scratch, it would probably be easier to grow some damn onions in the ground. Rest assured, if we have a doomsday with survivors, there will come a time when cravings arise again. Provided the jobs of raising livestock and planting root vegetables are accounted for, chip and dip knowledge will have currency. This I assure you, hero. This is not a recipe that can be whipped up in twenty minutes. As our neighbor said, referring to his afternoon on a Florida beach before an evening flight back to Boston, “My only regret was not being able to start caramelizing the onions in time.” Luckily, I was in New England, which forces its inhabitants indoors this time of year. So we all ate chips and onion dip later that night, some of us a paler shade than others. The dip is from Alison Roman of The New York Times. It is not difficult to make, but it requires an hour in the kitchen and you cannot stray far. Make it when there is also a pile of dishes to do, assuming Armageddon did not take care of them for you. The onions really do take an hour to caramelize, but they will soften and sweat, eventually turning sweet and dark. The rest of the ingredients add creaminess and necessary tang. The original recipe calls for sour cream, but I like crème fraîche and recommend it if you are feeling fancy. Though I prefer a classic chip, there is a sound argument to be made to use the ruffled variety for its sturdiness. Carrot sticks and celery are also welcome accessories. It would probably be spectacular on a roast beef sandwich too. 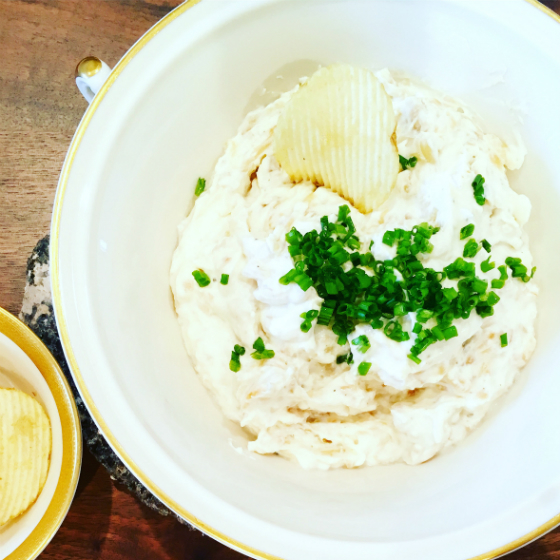 Onion dip is my ultimate comfort food. This was true when I was seven and it still is today. I want to believe there will always be a need for it. As a boost when life feels grim or, perhaps, to help repopulate the planet in good taste when the time comes. In a large skillet or saucepan, heat the oil. Add the onions and shallots and season with salt and pepper. Cook on medium heat, stirring often, until the onions soften and turn golden brown. Reduce the heat to low and continue to cook, stirring regularly to prevent sticking or burning in the pan. If they threaten to burn, turn down the heat. Cook for 45 to 60 minutes or until the onions have shrank in size and are caramel-colored. Meanwhile, combine the next four ingredients (all except chives) in a medium bowl and place in the fridge. When the onions and shallots are done, finely chop them on a cutting board. Let cool to room temperature and then add them to the bowl with the yogurt mixture. Season to taste with additional salt and pepper. Transfer to a serving bowl and top with the chives.